Small Businesses are the backbone of a country’s economy, simply because they opens up doors for new opportunities and provide jobs. However, only a few small businesses among these businesses excel at what they do. Needless to say, businesses that excel use proper techniques of branding, social media promotion, website creation and most importantly, SEO. But why do we need SEO? In today’s digital world, getting discovered by the right people is what really matters; and implementing SEO is one of the most successful techniques of achieving that. Businesses need SEO in order to be discovered by the right people looking for products or services that are offered by these organisations. The point of investing in a website is to showcase the products and services to a variety of customers, which explains why people invest a considerable amount of time and money designing them. But once your website is done, it must be made discoverable. To do this, one must implement SEO and make the website, products and services visible for highly relevant keywords to people searching for them. Implementing SEO for your business has a direct impact on traffic and even leads generated. Implementing SEO is a great way to make your website and content user-friendly. Considering that users arrive at your website using keyword and keyphrases, it is a good idea to optimize your website with keywords that your users relate to. If you use keywords that your users want to read or find, you’ll catch their interest. If they are interested in your website content, you are inevitably giving them a positive and useful experience. SEO is also great for opening up your businesses to the global market. Geography and time often act as constraints in business. But with SEO, your services and products can be made available to users all over the world. In contrast to this, if your service or products are local, SEO can prove to be highly beneficial in that case too! Just like a race where everyone runs to win, similarly for a business to flourish one must compete with the big businesses in the market. Implementing SEO also gives you an edge over your competitors. The unique keywords and key phrases you select to represent your business and website will help you differentiate your business from your competitors. If done right, SEO can bring massive benefits by ranking your website on the top of SERPs. Your SEO is your identity that will help your users and visitors recognize your business. If you have implemented effective and quality SEO for your business, it will reflect on SERPs. If your business website appears on the first page of Google or even better, the top three results, your business will be considered highly credible and authoritative. Google updates its algorithms on a daily basis to ensure that users get the most useful and relevant information. Therefore, making an effort to bring your website to the top few results of Google will have huge returns! If users see your website on the top of SERPs, they will automatically trust your business. This is also because users have a great deal of trust and faith in the guidelines and protocols followed by Google. So if Google brings you to the top, users are likely to trust your brand instantly. Perhaps one of the best qualities of SEO is that it is highly cost-effective for the kind of returns it can bring to your business. SEO tools that help you research and sort keywords such as keywordtool.io or the Google keyword planner are free! The only cost you will probably have to incur is the resources you will hire to carry out your SEO. Or if you want to purchase paid tools such as SpyFu that let you extract your competitor's keywords. But for a service that does not cost much, SEO has great returns in the long run. Implementing SEO is definitely an investment that all small business owners should make for their business. It is a great way to get discovered by the right people for the right reasons! Moreover, it can bring huge profits, which is often the end goal of most businesses. 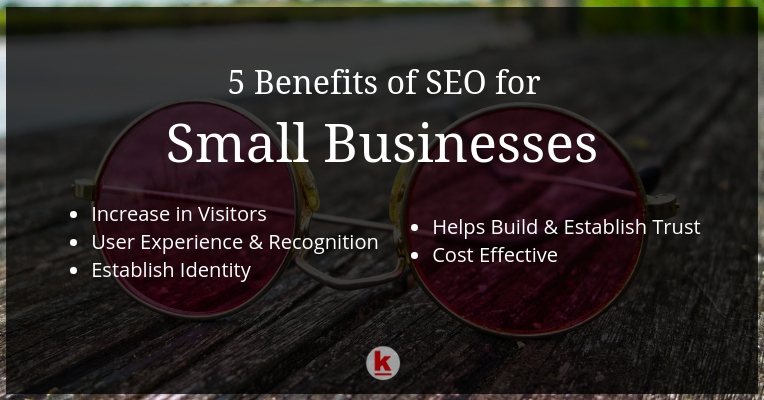 We hope you’re now familiar with the 5 key benefits of SEO and why you should implement SEO. I need to stay on top of this and make sure that I understand everything fully!! Nothing new for me but that was useful.